Maybe you just purchased a new home or maybe you’ve simply decided you’re tired of grilling on the grass. Either way, you’ve got two good options to create a hard surface in your backyard – a deck or a patio. The question is, how do you decide between the two? There are definite pros and cons to each, and today we’re going to be taking a look at what might make one right for you! Decks & Patios – What’s The Difference? So first things first, let’s talk about what separates a deck from a patio – in all fairness, the two are fairly similar, and the words are often used interchangeably. 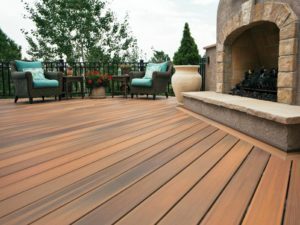 A deck is typically constructed from either a wood or composite material, and is almost always elevated off the ground (even if it’s only by a few inches). They’re usually attached to the house and designed to complement the landscaping and hardscaping of the existing environment. And when it comes to installing a deck, there are a few extra rules – permits are usually needed and there may be special code requirements, such as mandatory railings. 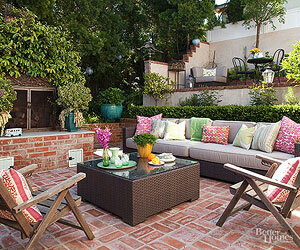 A patio is an open space, similar to a courtyard, with no walls or railings to box it in. Patios may be connected to or simply adjacent to the home, or even somewhat removed from the main building. They are typically built at ground level, and can be made in just about any size, shape, and material. One of the biggest pros about a patio is the ease with which it can be constructed (and deconstructed if necessary). Because a patio is essentially just a large, hardscaped surface in the ground, there are far fewer rules and regulations about what can be done. Additionally, patios tend to be way cheaper than decks, primarily because of a difference in material cost. On the negative side, patios may be cheaper up front, but they also typically don’t add as much value to the home in the long run. Due to the natural, usually unprotected materials, a patio can also require more maintenance – replacement of gravel, repair of cracked concrete, etc. Perhaps the greatest benefit of a well-constructed deck, in addition to the aesthetic appeal, is the increase in value for your home. Estimates for the average value increase of a deck are typically between 75-90% – meaning a $5000 deck could add $3750-$4500 in resale value to your home. That’s a pretty solid return on investment. Also, decks make a wonderful space to spend time outdoors, and can add some great contrast to an otherwise flat-looking backyard due to their height and appearance. That said, unlike a patio, decks often require a lot more planning before construction can begin. County or municipal permits will require that you have site inspections, meet certain codes, etc. And decks certainly aren’t maintenance free either – depending on the weather and the effort expended on routine upkeep, they may require an equal amount of work to keep in good shape. This entry was posted on Friday, May 5th, 2017	at 10:57 am	. Both comments and pings are currently closed.